Light & Darkness Radio: Featured Today! "Seraphim,Tears of Martyr..."
Once again and as a tradition L&D bring you more featured bands of the day here they are! 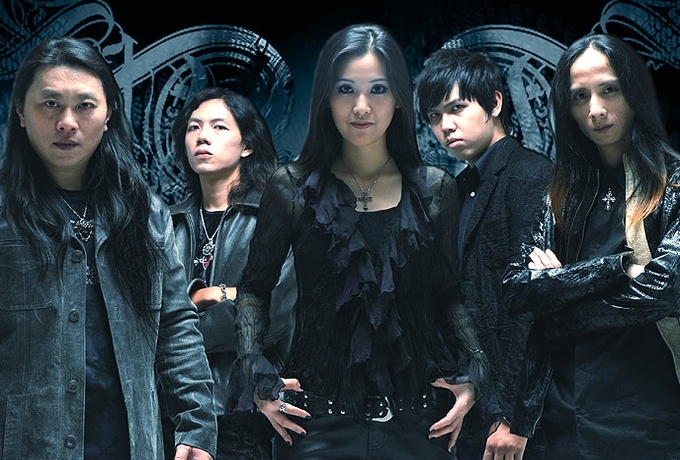 Seraphim (TAI) - Seraphim, an amazing melodic power/heavy metal band from Taiwan. Its style of music has been widely recognized on many heavy metal websites in more than 35 countries in European, American, Asian, and Oceanian continents. Because of five members' efforts and fans' support, Seraphim has become the top-ranking band among the Melodic Power Metal bands in Taiwan. As soon as established in 2001, Seraphim has caught the attention of Magnum Music, which later signed the contract with this band. Up to now, three albums had been issued, including The Soul that Never Die, The Equal Spirit, and Ai. The production of these three albums was assisted by Fredrik Nordstorm in Studio Fredman in Sweden, and the overdubbing was assisted by Mikko Karmila and Mika Jussila in Finnvox Studio in Finland. These albums were appreciated by famous album publishers in Japan, Spain, and Russia. Seraphim has become the only band touching the European continent, the cradle of heavy metal. This band is named the star of Asia by Castle of Pagan, one of the famous Japanese heavy metal websites. Right now, the albums of Seraphim are available in more than forty one websites of countries in the world, and they are expected to be accessible in more other countries.Seraphim is widely known in the international music circles. The member of Seraphim have received an amount of interviews with a lot of mass media, including the Burrn! magazine in Japan, NHK in Japan, the Japanese Chinese magazine, well-known critic in Japan -- Captain Wadas interview, "Dreamkeeper" live program radio show of Moscow, Music InFection TV of Moscow, ATV in Hong Kong, and Hong Kong's HOLE magazine. To thank for the fans support, all members of Seraphim routinely stroll around Taiwan. In addition, they have been frequently invited to perform overseas. For instance, they were once invited to perform in Beijing Midi Music Institute, and Muisc Festival in Kun-ming. Moreover, it has begun its first World Concert Tour since 2004, and the sites include (1) Taipei, Taichung, and kaohsiung in Taiwan, (2)Tokyo and Osaka in Japan, (3) Hung Hom in Hong Kong, (4) Moscow in Russia, (5)Krefeld/DOA Festical and Cosfeld in Germany, and (6) Beijing and Shanghai in China. In 2006, the lead Vocal ¡¹ Quinn had invited to performe a new song in the new album of "Beto Vazquez Infinity", the album called "Flying Towards The New Horizon". And the song that sung by Quinn was ¡æShe is my Guide¡ç. In the same year, the guitarist ¡¹ Kessier was proudly endorsed by Ibanez guitar, it would be a yet another honor to SERAPHIM. In 2007, Kessier was proudly endorsed by Hughes & Kettner and DiMarzio again. In the same year, the drummer ¡¹ Van was proudly endorsed by MAPEX. The good news was to go from strength to strength, and then Seraphim was proudly endorsed by Voodoo Lab, Rexer wireless and Hercules stand in succession. However, first-class brand of company identify Seraphim that make them to become the endorsement pioneer in Taiwan. They started "Rising European tour" from Aug 07', they've palyed many great concerts there, Raismes Fest, MFVF5 and as a special guest with Kamelot in Holland. Now, Seraphim planned to release the fourth album " Rising" this year, and will spread the "Rising European tour part 2" this autumn. Seraphim has been playing an important role in the history of Heavy Metal. Its members will devote themselves to the composition and continue the immortal legends of Melodic Power Metal. Tears Of Martyr (SP) - Tears of Martyr is a Symphonic Gothic Metal band born in Las Palmas de Gran Canaria (Canary Islands, Spain) in the mid 90's. The band was initially very influenced by Death and Doom Metal, and with the inclusion of piano arrangements and a female lyric voice the band started to achieve a more personal sound, where metal entwines with classical music. In 1996 they released their first demo titled "The Essence of Evil" which received very good reviews and helped the band to build solid foundations to develop the concept of ToM from that time forth. After numerous comings and goings of some band members due to the always tough local metal scene, ToM recorded their second demo "Renascence" in 2005, where they precisely show the path chosen for their compositions. The result of many years of work within the metal scene in the Canary Islands is translated into a big amount of shows with Top Metal Bands such as Dark Tranquility, To/Die/For or Swallow the Sun, just to mention a few. In January 2007 the band decides to move to Madrid with the idea of spreading the word about ToM (they opened for Draconian in their fist show ever in Spain in 2008). June 2009 their first full-length debut "Entrance" is ready, which was recorded with producer Alberto Seara at Estudios Cube. Adamantra (FI) - Adamantra is a Helsinki, Finland based prog metal group. The idea of forming the band saw daylight three years ago, when bass player Jukka Hoffrån started recording some of his tunes and ideas on a friends computer. As the songs started to find their final shape during the process of preproduction, it was time to form a band to perform the music. Regardless of placing numerous ads on music magazines and sites, a fitting line-up was somewhat difficult to create. Nevertheless, the solution could be found closer than one could suspect. Tuomas Nieminen, Tommi Ahtila and Panu Kiskola were already familiar from earlier bands and line-ups. Plans of forming a high-quality melodic metal band with drummer Mikko Sepponen also dated way back. All in all, the Adamantra line-up includes musicians from such bands as Bride Adorned, TOC, Craydawn, DIVERCIA, Mind-A-Stray, OLYMPOS MONS, Thaurorod.. First rehearsals were held about one year back, and in April 2006 the band entered the D-Studio to record their first promo CD. Influences of progressive metal greats Symphony X, Dream Theater and Shadow Gallery can be heard in the music of Adamantra, as well as traces of more traditional power metal in the vein of Blind Guardian and Rhapsody. Elegy of Madness (ITA) - After the production of the project “Another Path”, the Elegy of Madness go on their path by the first coproduced full length called “The Bridge of Sighs”. During the spring of 2007, the Elegy undertake “another path” that could bring them back to a different world made of music and emotions, leaving behind the problematic earthly reality. It seems like a “spleen” towards the existence, a will to escape from the real world. The detach from the daily is a very important theme also resumed in the new project “The Bridge of Sighs”. This bridge really exists in Venice and still remains the subject of many legends. According to one of them, in the XVII century the bridge served to the prisoners to arrive into the dungeons. Someone said that the prisoners sighed during the passage, the last moment to look for their Venice and the outside world. The bridge also represents a suspension between different realities, in particular between Tonal (normal consciousness) and Nagual (separated world). So it indicates all the things that go beyond the everyday life. The purpose is to reach an union point between the two dimensions. “Prelude” and “Elegy of Madness” indicate the beginning of the listen. Both of them explain, in their texts and music, the meaning of the name of the band: the elegy seen as a passionate and tormented essay is connected to madness, the only mood to make use of the instinctive part instead of the rational one. The tracks included in the disc take again two songs already placed in the first project: Another Path and Voices. Moreover, it’s very important explain the meaning of the Suite “Agony Part 1” and “Agony Part 2- Sad Wind”: they take up the actual theme of euthanasia. While in the first musical movement the argument is faced through the perspective of the patient, in the second one it’s stressed the sense of powerlessness that haunt his relatives. Since the “Suite Agony”, it takes inspiration another track called “Threshold” in which you can imagine a path beyond life passing through the so known “three doors”. Among the other pieces, it’s also very important remember No Names because of its meaning. Indeed, it’s an allusion to the last chapter of “Uno,nessuno,centomila” wrote by the Italian Pirandello: the society imposes to men many masks to be worn from whom the protagonist wants to escape. Men are conceived as an infinite and free flux of energy. Therefore, we can say that le “fil rouge” that connects the two projects is the will to go beyond the ordinary world. Generally speaking, we can say that the composition of Elegy of Madness band derive from the musical influences of each member, and in particular from bands such as: Nightwish, Epica, After Forever, Dream Theater, Rammstein and Stratovarius. The main objective of the band is to communicate to its listeners, the musical passion of all its musicians: the unique source from which the EoM take their force and energy to face the right difficulties and the remarkable sacrifices that the musical word imposes. BIOGRAPHY The group was created during the spring 2006 thanks to the guitarist Antonio Tomasicchio. The purpose is to create a typically gothic sound introducing progressive themes, too. The initial line-up was composed by: Tony (guitars), Alex (bass), Marcello (keyboards), Nico (drums) and Anja (voice). This band worked to create the first demo called Another Path, promoted during many national live shows. The first and last change in the line-up concerned the substitution of the drummer Nico with Roberto Raio. Another Path has also been reviewed and interviewed by many significant magazines. During one of the exhibitions of the band at 5° South’s Cheyenne Festival, an important contest, the Elegy of Madness were pointed out from Mario Riso, director of Rock Tv’s channel and drummer of the Razophonic group. After that, Elegy of Madness were invited to play during the program “Salaprove”, transmitted in all Europe through SKY in November and December 2007 and January 2008. All the unpublished songs that characterize Another Path have also been placed in the programming of many Italian, American and Spanish radios. Elegy of Madness have now recorded their first full length, called “The Bridge of Sighs” officially released on may 2009.